Regulates the excessive perspiration, without blocking your natural process, by 72h! The perfect care for perspiration! 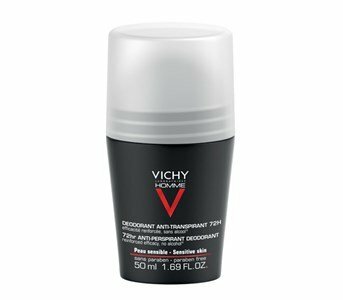 Is hypoallergenic, contains Vichy Thermal Water, mineral salts ultra-absorbent and inhibitors of excessive sweating! Formula rich in Active and ultra-absorbers minerals antiperspirants, regulates perspiration and humidity during 72h. The skin is comfortable without adhesive effect and the feeling of irritation, throughout the day and even more! Apply on the clean and dry armpits. father's day is almost there and we do not want you to stop pampering the best dad in the world. Yours! at the most romantic week of the year, we help you to choose a treat for your loved one.